Ready to increase your knowledge, learn valuable study skills, and gain self confidence along the way? Our qualified tutors are here to help you. We are a consortium of credentialed teachers and degreed professionals. Accredited Tutors offers individualized instruction allowing us to tutor in a manner designed just for you. We offer the following services. Our clients are happy with our services and want to pass the word along to help others. My sons, ages 4 and 5, have been taking lessons through Accredited Tutors for almost a year now. Both my sons were in preschool and I wanted to prepare them for kindergarten. I thought it would be great for their self esteem to be ahead in kindergarten instead of struggling during their first year of school. Their preschool is academically geared so Accredited Tutors’ lessons were a great compliment to their education. Within a couple months, my oldest son was reading. The teachers at school had always admired my oldest son for being attentive at school and always trying his best, but now they were impressed by his reading. My younger son is having a great time learning all the basic skills needed for preschool and kindergarten. Accredited Tutors makes learning fun and practical by using the outdoors, toys, and books for her lessons with my kids. A neighbor of mine was using Accredited Tutors for her two twin daughters who needed help in all their subjects. Accredited Tutors had an actual credentialed teacher who had taught fifth grade come and help her girls. So, I decided to hire Accredited Tutors to help my two kids as well. My kids are in 7th and 8th grade. My youngest needed help with her writing and my oldest needed help with his math. 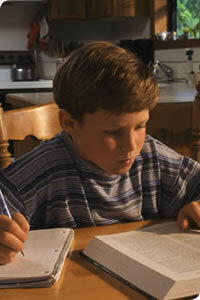 Accredited Tutors sent a terrific tutor to our house who helped improve both my kid’s grades. The kids enjoyed working with her and I will continue to use Accredited Tutors to help my kids stay ahead. I am in 10th grade and I was having a hard time understanding Algebra. I was receiving D’s on my tests. I was so frustrated! When my dad told me he was getting a tutor for me I thought “Well, I’ll try anything!” After about a month, I got a B on my test. My last test score was an A! I never thought I could get an A in math! So, I would use Accredited Tutors again and recommend them to my friends. I was really stressed because I had to prepare for the SAT’s and write my college essays within two months! I also had to do my regular senior school work. I called Accredited Tutors and a tutor saved me! She helped me study for the SAT and helped me write my college essay. One of the schools required a resume as well. The tutor helped me write my first resume too. I was so happy I found Accredited Tutors! I am a junior at University of California San Diego. I was struggling in geology. I assumed it would be impossible to find a tutor in Geology. I looked in the Yellow Pages and called Accredited Tutors. Surprisingly enough, they had a tutor! This tutor was able to explain geology in such a straight forward way I understood. My grades improved a full grade and I was thrilled! I am taking my M.B.A. program at Chapman College and needed some help in statistics. I called Accredited Tutors and a tutor came out to my house the next day. The tutor was so helpful in helping me study for my upcoming test. After learning I was failing the course (prior to calling Accredited Tutors), I received a B. I would definitely use Accredited Tutors again.